The science of the Vasse Wonnerup wetlands is focusing on improving our understanding of the ecology of the wetlands and impacts of water levels and quality, developing models to assess the potential impacts of altering the current water regime and evaluating management actions to reduce the risk of fish kills and improve water quality. View map. 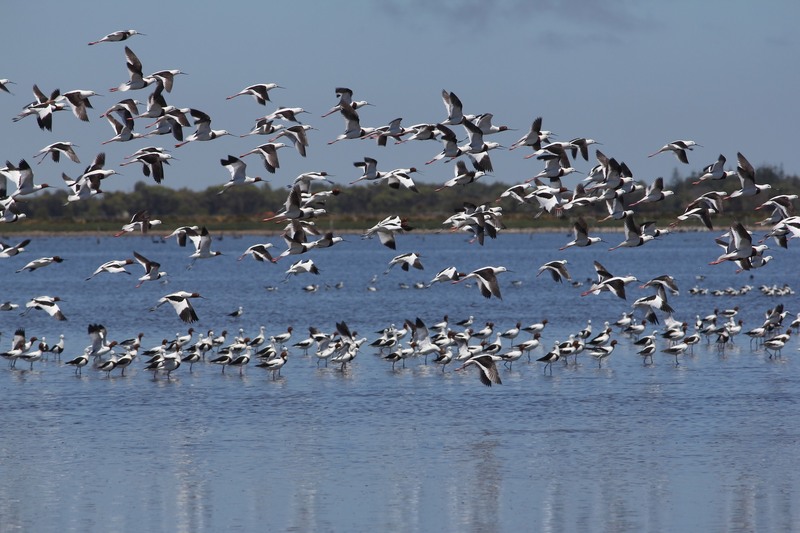 The Integrated Ecological Monitoring study aims to better understand the relationship between seasonal water regime (water quality and water levels) and the ecological values that support waterbirds on the Vasse Wonnerup wetlands. The Vasse Wonnerup wetlands have significant conservation values and were recognised as wetlands of international importance under the Ramsar Convention in 1990. The wetlands often support over 37,000 waterbirds from over 80 different species. Understanding the key variables that support waterbirds (habitat and food) and the impact of changing the water regime on those variables is critical for the future management of the Vasse Wonnerup wetlands. 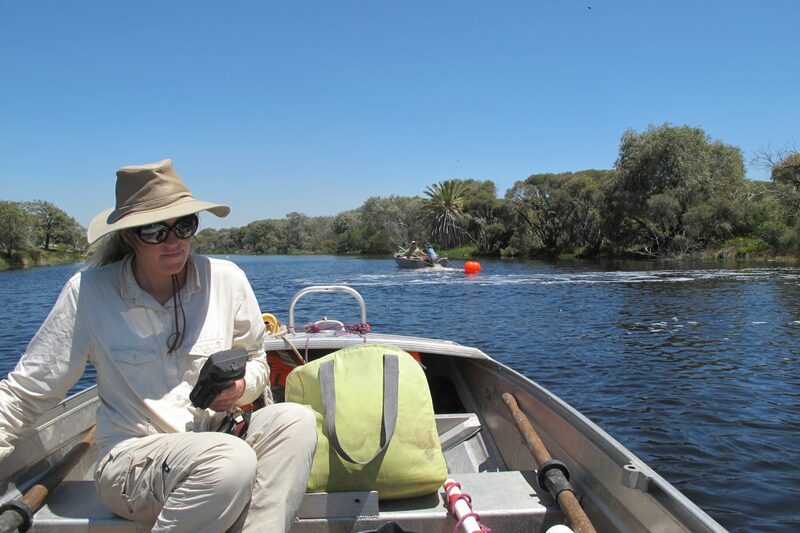 The project brings together scientists from Murdoch University and the Departments of Water and Environmental Regulation and Biodiversity, Conservation and Attractions in a collaborative effort to study the relationship between the different variables across a range of habitats within the wetland system. The study will undertake seasonal monitoring of waterbirds, their food sources (aquatic plants, benthic macroinvertebrates and fish) and water regime (water levels and water quality). 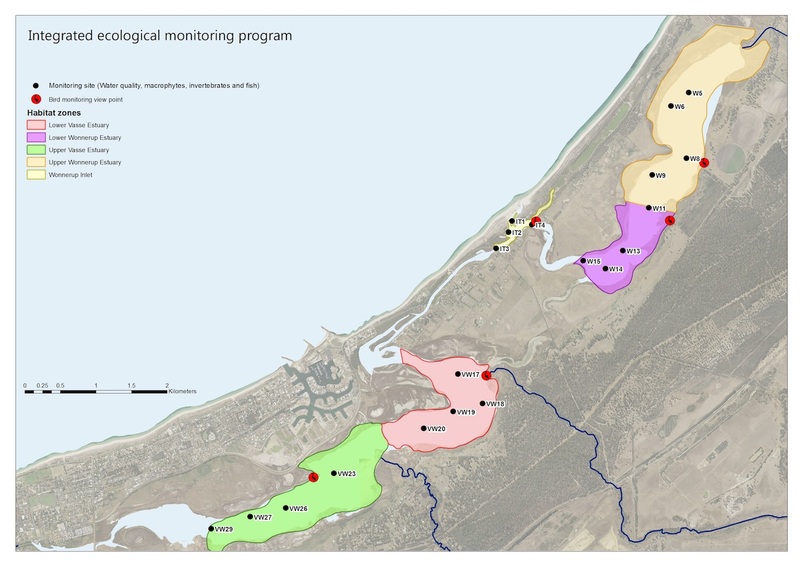 Monitoring will be undertaken within five habitat zones across the Vasse Wonnerup wetland system (Upper Vasse estuary, lower Vasse estuary, Wonnerup Inlet, lower Wonnerup estuary and upper Wonnerup estuary) over a two year period. The study commenced in March 2017 and will be completed in March 2019. The study will improve our knowledge of the physical and ecological characteristics of the wetlands and will identify critical habitats and/or food sources for waterbirds utilising the wetlands. 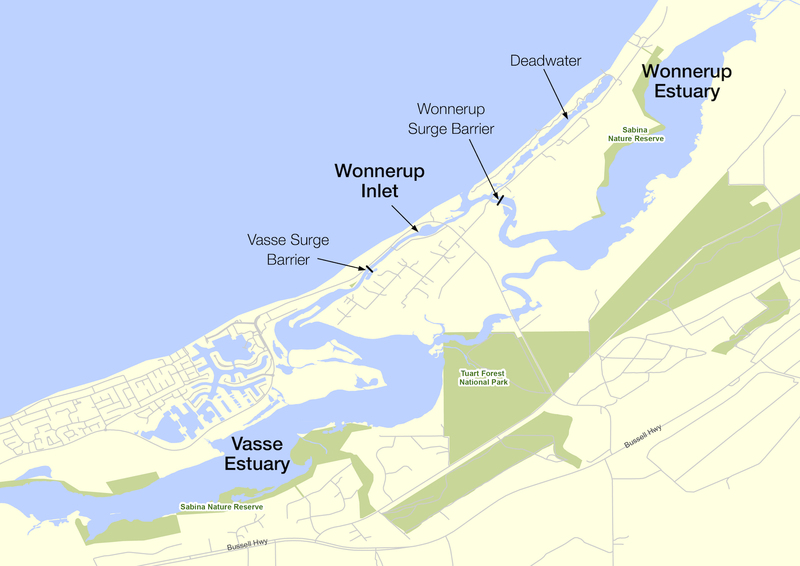 Results from the study be used in the review of surge barrier operations and inform the Vasse Wonnerup wetlands Operational Plan. The Black Bream recruitment study aims to monitor and assess the recovery of Black Bream in the Vasse Wonnerup wetlands after a major fish kill in April 2013 and to better understand the causes of poor breeding and survival of juvenile Bream in the years after the event. The Centre for Fish and Fisheries Research, Murdoch University is leading this study. Monitoring Black Bream recovery has occurred at least twice a year since 2014 and will continue until February 2019 under the Revitalising Geographe Waterways program. 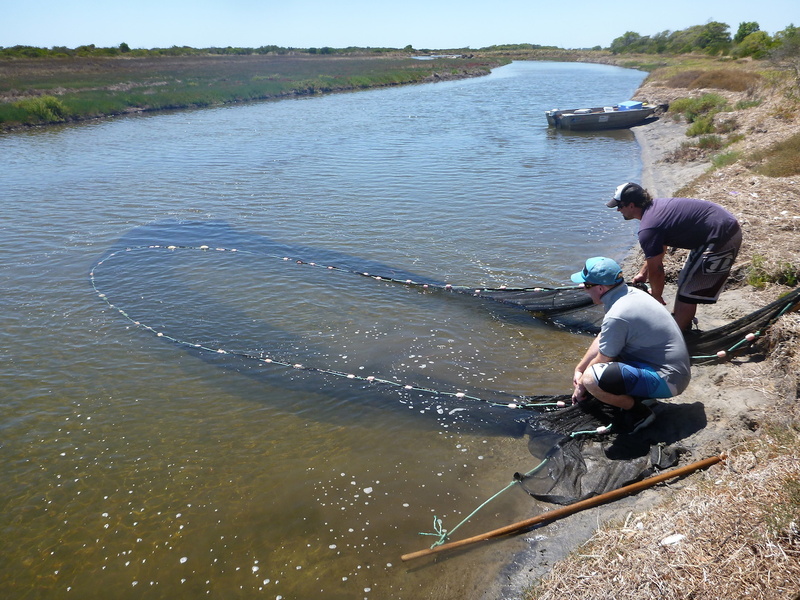 Monitoring of juvenile Black Bream has been carried out across eight sites in nearshore waters of the Wonnerup Inlet and Deadwater since February 2012 (year prior to major fish kill) using a seine net with 3 mm mesh in depths of up to 1.5m. Since 2014 a gill net with larger mesh sizes has been set in the adjacent offshore waters to monitor numbers of larger fish. Results so far show that although there is evidence of Black Bream recruitment since the 2013 major fish kill, recruitment has been slow and variable across years. Successful recruitment occurred in 2016 and 2017, however the numbers of juvenile Black Bream have not recovered to densities recorded prior to the fish kill. The latest report on this study can be found here. Monitoring will continue in 2017 and 2018 with a final report available in June 2019. Annual macrophyte snapshot surveys have been carried out in the Vasse Wonnerup wetlands by Murdoch University since 2006 with the aim to better understand the relationship between water quality, sediments and the distribution and abundance of aquatic plants, macrophytes (seagrasses) and macroalgae. Macrophytes are aquatic plants found in waterways and wetlands and are an important food source and habitat for the animals that live within the wetlands and the water birds that visit them. In the Vasse Wonnerup wetlands that main macrophytes are seagrasses. Macrophytes also play an important role in stabilising sediments and utilising nutrients. Macrophytes are impacted by excessive nutrients both through competition of other aquatic plant species (macroalgae – large algae mats and phytoplankton) that shade out macrophytes, and through inhibition to growth from high levels of nutrients. They are therefore an important barometer of the health of the wetlands. 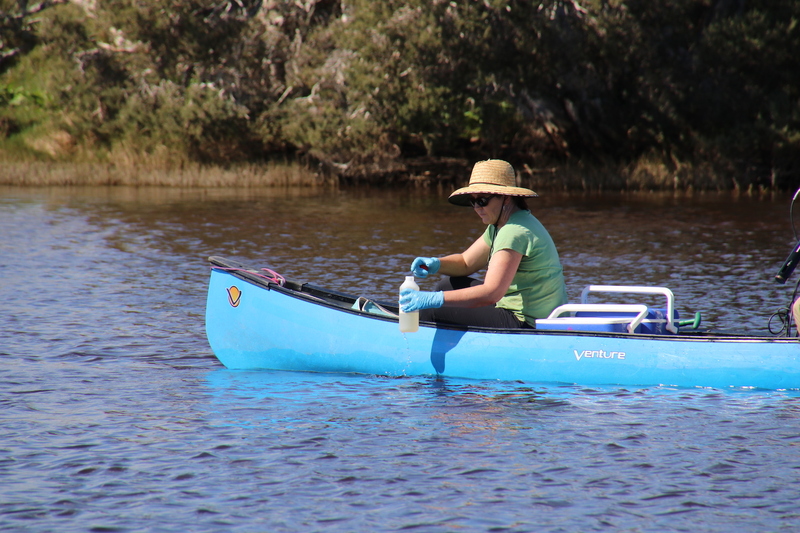 Annual surveys of aquatic plant species (macrophytes and macroalgae), distribution and abundance has occurred across 28 sites in the Vasse Wonnerup wetlands with water quality and phytoplankton samples collected from 11 of these sites. Monitoring has mostly been conducted in spring (November) corresponding to peak biomass of aquatic plants. Summer monitoring was also carried out in 2009, 2010 and 2012 when water levels are at their lowest. The Vasse Estuary Seawater Inflow Trial has occurred over summer months since December 2014 with the aim of monitoring the impacts of seawater inflow on water quality in the channel upstream of the Vasse surge barrier. A common request from the community to improve water quality and reduce the risk of fish kills in the Vasse and Wonnerup estuaries over summer is to allow seawater to enter the estuaries through the surge barriers. The surge barriers were installed in 1908 to prevent seawater entering the upper estuary bodies and flooding adjacent low lying agricultural land with salty water. Since 1988 seawater has been let into the upper estuaries over summer/autumn intermittently to reduce the risk of fish kills. This management action has had mixed results. Anecdotal evidence suggests that in some cases opening the gates has prevented fish kills, however major fish kills have occurred even when seawater inflow has occurred for extended periods. Allowing too much seawater back into the upper estuaries also poses a risk to surrounding vegetation. This study will improve our understanding on the impact of seawater on the water quality in the channel upstream of the Vasse surge barrier that is characterised by toxic phytoplankton blooms over the summer/autumn period and variable dissolved oxygen levels. The study will be complimented by modelling undertaken using the Vasse estuary model to determine the impacts of increasing salinity in the broader Vasse estuary and the Integrated Ecological Monitoring study which will identify critical habitats and food sources of water birds that may be impacted by increasing salinity. The Department of Water and Environmental Regulation is leading this study with input from the Vasse Wonnerup wetlands Science Advisory Group. A report on the results of the seawater trials will be available in December 2018. The fish movement study aims to better understand how fish move through the fish gates in the Vasse surge barrier. The fish gates were installed in the upgraded Vasse and Wonnerup Surge barriers in 2004 to allow fish movement between the estuary bodies and Wonnerup Inlet, prevented by the surge barrier structures. A major action of the Fish Kill mitigation and response project is to open the fish gate in the Vasse estuary over summer when water quality conditions deteriorate to allow fish to escape into the Wonnerup Inlet. This study will determine the effectiveness of this management action. Centre for Fish and Fisheries Research, Murdoch University is leading this study. It will complement a previous study undertaken by Murdoch University to determine the movement patterns of Black Bream and Sea Mullet within the Vasse Wonnerup system using acoustic tags (link to study PDF ). Up to 500 fish including Black Bream, Sea Mullet, Yellow‐eye Mullet and at least one species of hardyhead and goby will be tagged over a two year period using Passive Integrated Transponder (PIT) tags. The tags are very small, inexpensive and can be implanted quickly into the fish without major surgery. A passive listening station has been set up with antennas in the fish gate chute of the Vasse surge barrier that detects fish when they pass within a certain distance. Data will be downloaded periodically over a two-year period and analysed to determine the movement patterns of fish through the fish gate in relation to environmental variables (e.g., water levels, bar opening, rainfall and freshwater flow). Nearly 200 fish were tagged in 2016 with the help of Busselton High and Georgiana Molloy Anglican School students and community members. Fish movement through the fish gate have been detected since the fish gate was opened in March 2017, demonstrating that the technology works. A further 300 fish are hoped to be tagged before the 2017/18 summer. The Final Report on this study will be available in June 2018. This Report will inform the Fish Kill Mitigation and Response Plan as well as the Vasse Wonnerup wetlands Operational plan. The oxygenation trial was conducted over the 2015/16 and 2016/17 summers upstream of the Vasse surge barrier. 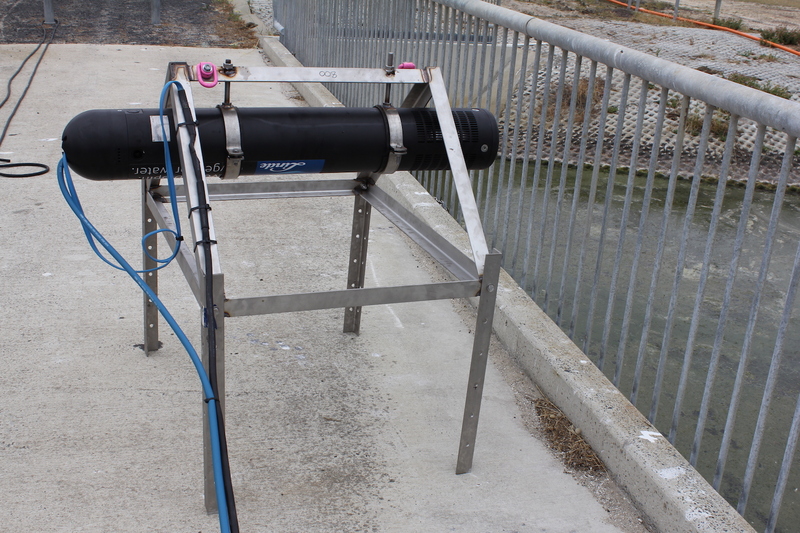 The aim of the trial was to assess the effectiveness of a mobile oxygenation plant in improving dissolved oxygen in the channel upstream of the Vasse surge barrier. The channel in front of the Vasse surge barrier is long and narrow and characterised by poor water quality over summer with low dissolved oxygen levels. Low dissolved oxygen levels have often been implicated with major fish death events in the Vasse estuary. Improving dissolved oxygen in the channel upstream of the Vasse Surge barrier is an important management action to reduce the risk of fish kills. 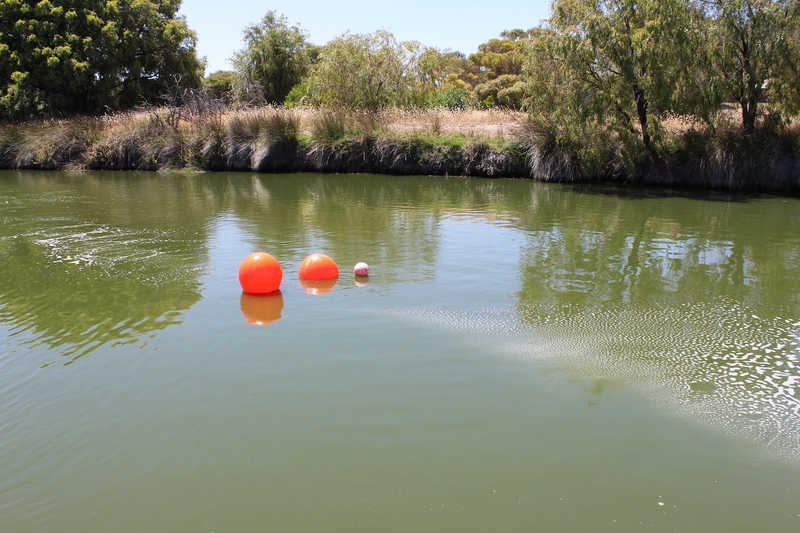 Oxygenation plants have been used successfully in the Swan and Canning Rivers to improve conditions for fish and it was with that experience that the oxygenation team from the Department of Water and Environmental Regulation established the oxygenation trial in the Vasse estuary. Monthly Water quality monitoring on the Vasse Wonnerup wetlands has occurred since December 2014 to gain a better understanding on the seasonal variability in water quality parameters. 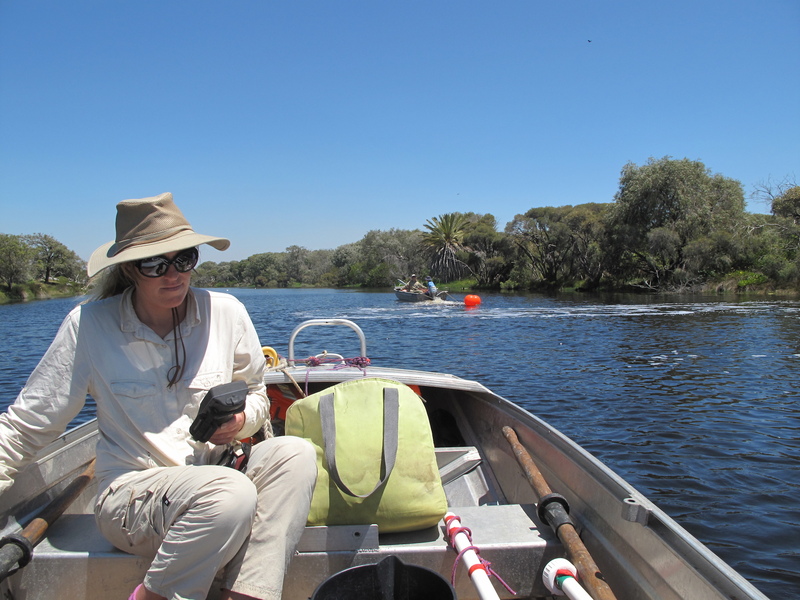 Monthly water quality data will be used to populate the Vasse Estuary model that is being developed by the Department of Water and Environmental Regulation in collaboration with the University of Western Australia. 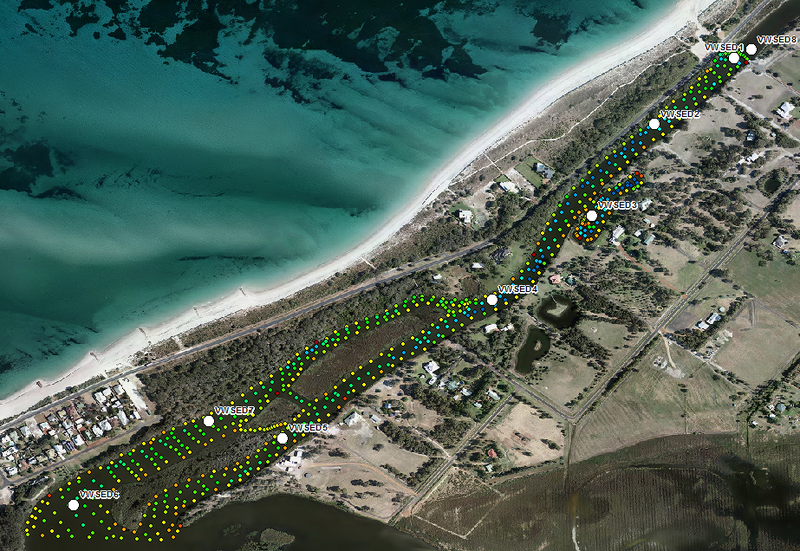 The model will be used to predict water levels and salinity in the wetlands of a range of management scenarios proposed by the Vasse Wonnerup wetlands Collaboration to investigate under the Review Surge Barrier Operations project. The model will also be used to guide management decisions in allowing seawater into the Vasse estuary over summer months to reduce the risk of fish kills. Sediment investigations in the Vasse estuary channel took place in October 2016 to assess the volume and composition of sediments in the channel approximately 1.2km upstream from the Vasse surge barrier. Link to map the accumulation of organic sediments in the channel contribute to poor water quality, visual amenity and offensive smells over summer. The investigation, coordinated by the Department of Water and Environmental Regulation, found that the organic sediment layer is highly variable along the channel, with build-up occurring mostly along Estuary View Drive and in front of the Vasse Surge Barrier. Analysis of the sediment determined that it was organic, containing monosulfidic black ooze (MBOs), with highest densities in front of the Surge barrier. MBOs can affect water quality by lowering dissolved oxygen in the water; releasing hydrogen sulphide gas and cycling phosphorus from the sediment under low oxygen conditions. This is what causes offensive smells and contributes to poor visual amenity and water quality. The sediment was not contaminated with metals or pesticides. As a direct consequence of the sediment investigation the Water Corporation removed approximately 300m2 of organic sediment in front of the Vasse surge barrier in June 2017. Sediment was removed via a suction pump mounted on a floating pontoon. The slurry of sediment and water suctioned from the channel was transferred into trucks for transport to the sludge drying beds at Water Corporations Busselton Wastewater Treatment Plant. The slurry was added to other sewerage sludge at the treatment plant and subsequent drying, mixing and disposal of the waste took place as part of Water Corporations standard operations. A report on the sediment investigations and removal at the Vasse surge barrier including options for removal of sediment in other areas of the Vasse Channel is currently being finalised.